Texas’ search for more defensive linemen could lead to an acquisition in the JUCO market now that defensive end Jacoby Jones of Butler C.C. (Mo.) de-committed from Oklahoma on Monday. 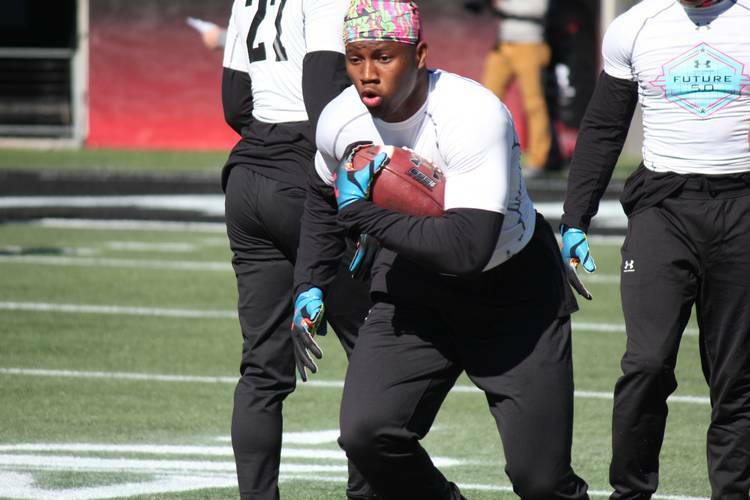 The 6-4, 250-pound three-star was offered by Texas back in May and is expected to visit Austin this weekend for the Iowa State game. He pledged to the Sooners on Sept. 16. Texas has two prep defensive end pledges — T’Vondre Sweat and Peter Mpagi — for 2019. The class is ranked seventh and consists of 20 members. Defensive line remains one of the concerns before the early signing period starts on Dec. 19. Texas will lose all three starters along the line after this season and Jones would provide defensive coordinator Todd Orlando an older addition to the rotation. Jones is the No. 24-ranked overall prospect and the top-ranked strong-side defensive end in the JUCO ranks, per the 247Sports composite. The Longhorns are one of 17 programs to offer him and are the overwhelming favorites now that Jones is a free agent. He’s a big-bodied end who excels at the point of attack. He’s athletic enough to get after the quarterback. He would immediately contend for snaps in 2019 and also would represent a recruiting win over Oklahoma. The 2020 class is two members deep with the pledges of in-state quarterback Hudson Card and offensive lineman Logan Parr. Three-star outside linebacker Michael Henderson of Carrollton Ranchview named the Longhorns in his final six on Monday. The 6-2, 220-pound prospect also included Oklahoma, Florida and Texas A&M. Henderson picked up a UT offer on July 31 after a visit to campus for a summer camp. He’s an all-around athlete who earned second-team all-district honors at quarterback as a sophomore. He’s big and can get sideline to sideline on defense. His football IQ and versatility intrigued Texas and dozens of other top programs across the country. Noah Cain trending toward Texas? The recruitment of IMG Academy (Fla.) running back Noah Cain was smooth and steady throughout the recruitment process. The former star at Denton Guyer never waivered on his plan to commit in December and enroll early at the university he picks. The four-star was never in a hurry and wanted as much information as possible before making a four-year decision. More of that information came his way Monday night when five-star running back John Emery Jr. pledged to LSU. Emery is the second-ranked running back in the class, trailing only Trey Sanders, who is a teammate of Cain’s at IMG and a target of Texas. It’s looking likely that Sanders is destined for Alabama. The commitment of Emery to LSU now means the Tigers aren’t in the market for another high-profile commit at the position. That’s good news for Texas. Four-star running back Derrian Brown is also committed to the Longhorns. Texas needs two backs in the class with Tre Watson set to graduate and only freshman Keaontay Ingram contributing on a regular basis. Cain is the seventh-ranked player at his position in the cycle and would be an instant-impact contributor at Texas. Penn State, Georgia and Ohio State are also in the mix.